Less than four hours drive from Sydney, Port Macquarie will provide the perfect getaway for the Queens Birthday long weekend in June, as the Howling Moon Blues Festival gets set to take your blues experience to the next level on Saturday June 8th. Port Macquarie’s Howling Moon Festival is in it’s second year of showcasing the best home-grown live blues music in an Australian quality music event. The winter festival creates the perfect space to sit back, relax and listen to some heart-starting blues and roots music, the perfect antidote for the winter blues. The first headlining act announced is Ray Beadle who has emerged as one of Australia’s most respected practitioners of “Jump Blues” and “Swing Blues” music. Following successful tours of the USA, Ray had the great privilege of playing with legendary, world class blues guitarist Chris Cain. On the road together, Chris described Ray as “unquestionably one of the finest musicians I have come across. His song writing has a harmonic and emotional depth that many strive for but few capture”. On Ray’s guitar work, “well lets just say, this cat is dangerous”. Ray Beadle’s career as a guitarist started when he was just 9. He released his first solo CD “Movin’ On” in 1998, a CD with the famous King Brothers in 2000 and “The Good Life” in 2001 with his band, the Vipers. Next up is Steele Syndicate and they are all about the groove. 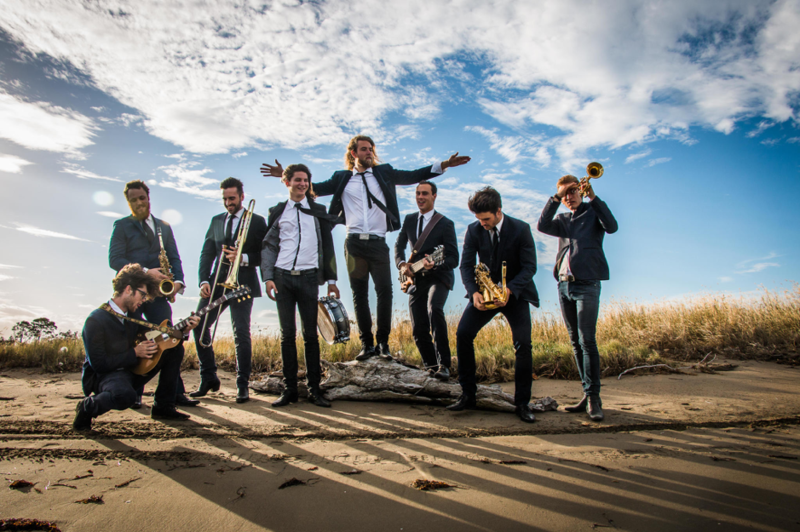 Steele McMahon’s Brisbane-based octet is raucous, punchy and fun, with a genre-bending sound that re imagines elements of old school funk, reggae, ska and indie rock. The band packs a roaring, four-piece horn section and a rhythm section to match, creating music from soulful, contemplative ballads to dance-inducing funk frenzies. It’s a be-suited, instrument-hopping unit! Since the release of their debut EP in 2016 and two singles last year, the band has brought its dynamic live show to the Newstead Roots Festival, Gum Ball Music Festival and headlined the Teneriffe Festival. With a second EP on the way and its first east-coast tour under the belt, The Steele Syndicate spent 2018 on the road, unleashing its evolved, groovier-than-ever tunes onto audiences all around. Well known for his crazy live shows and smooth vocals, Rusty Pinto leads the authentic and exciting Rusty Pinto Combo. Emerging from the wild west, Perth in Western Australia and drawing influence from 1940’s and 1950’s ‘Cat Music’, the Rusty Pinto Combo are making a name for themselves as a must-see live act. Completing the perfect line up are Port Macquarie festival favourites Ghost Road. The local, original band pumps out their own style of roots music. They have been on the road for ten years entertaining and wowing audiences with their distinctive blues sonic. Expect a rowdy, high-energy, hip swinging live performance as Howling Moon punters go wild for the Bennett boys, Brody and Ben. Completing the main stage line up will be The New Savages and Darren Jack Band. The busking stage will come alive with performances form Dan Hopkins & The Generous Few, The Roys, The Barflys and Ruby Blunt. The festival event includes a dedicated VIP area designated for 50 people only, for those who wish to enjoy the show in the Boho Lounge area. The VIP experience includes a drink on arrival, all day share platter, meal vouchers, covered Boho themed area and VIP Lanyard. Watch out for live painting by our local deadly painters, winter fire-pits and many more experiences synonymous with blues culture.